The nights may be long and dark in winter but you can always brighten up your day with a visit to one of the Christmas Markets in Amsterdam. Whether you’re seeking shopping inspiration, ice-skating fun, or sweet treats and hot chocolate under fairytale lights, this season there’s enough to do in every neighborhood in town. Browse through our guide with the 10 Best Amsterdam Christmas Markets for a wonderful afternoon or evening out! A magical makeover turns Rembrandt Square into a winter market during the Holiday season. Market stands and après-ski bars offer warming comfort food and beverages like mulled wine and hot chocolate will make for a wonderful evening out. Go for a slide on the ice skating rink and browse through the stalls in search of Christmas gifts. When you’re there, don’t miss out on a traditional Dutch treat: poffertjes. These mini pancakes with butter and powdered sugar are truly delicious! On Saturday 8 December Atelier Schinkel will be the host of the very first edition of FASHIONLAND: the Christmas Edition. This event combines fashion with music and lifestyle, all in the spirit of the Holidays. Enjoy an afternoon of outfit shopping while listening to a live DJ set and tasty bites and drinks. Numerous local brands like Daylliance and WantedbutWild will be present to make sure you’ll look at your best during all the upcoming festivities. Gemütlichkeit, delicious food and cozy drinks with friends and family. What’s not to like. Expect there to be traditional German food such as currywurst, Flammkuchen, soups and knitters at this Berlin inspired Christmas Market. 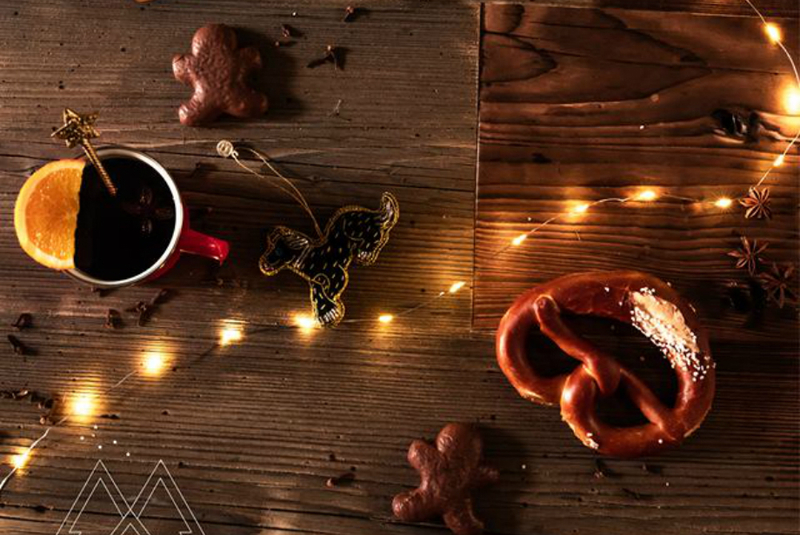 And to warm your hands and heart: Glühwein, hot chocolate and special winter beers. The entire weekend there are plenty of fun activities for young and old. Christmas music, a specially designed curling track, stands with gifts and other goodies and more! 8 and 9 December – Van der Helstplein – 12:30 to 10:30 p.m. The monthly Museum Market will be all about the Christmas spirit on Saturday 9 December. In front of the iconic Rijksmuseum on Museum Square and right next to the Winter Wonderland Ice Amsterdam, you can stroll along the Museum Market offering anything from gift items to unique art. Meet the local makers at their stands and be entertained by numerous live music performances. Hungry? All sorts of different comfort foods and beverages can be found at the market. 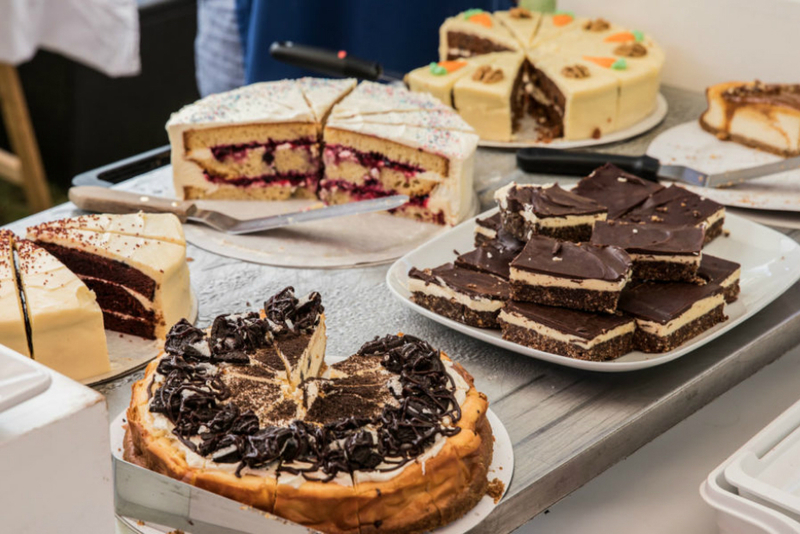 From traditional Dutch treats to German sausages and even Japanese bites! 9 December – Museum Square – 12:00 to 6:00 p.m.
15 December – Aambeeldstraat 34 – 10:00 a.m. to 5:00 p.m.
Not your traditional Christmas Market: the Japan Fair Festival. 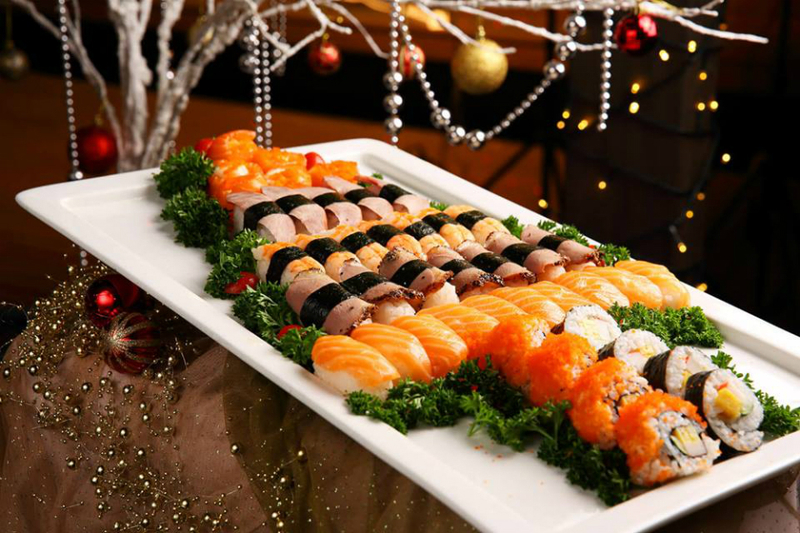 On 15 and 16 December the NDSM Loods will turn into an amazing Japanese Christmas Market offering anything from beautiful gift items to fun activities and tasty Japanese food like sushi and traditional desserts. Besides all the treats and goodies you can get at one of the many market stands, the experience goes even further. Expect there to be arcade games, workshops and karaoke amongst other things. Both young and old will have a good time here! The Pure Markt is a returning market that let’s its visitors explore the taste of all sorts of cuisines. From traditional Gouda Cheese to Surinamese Roti, American pies and French wines. On 15 and 23 December it’s time for their special Christmas editions! Expect lots of delicious locally prepared food to enjoy on the spot or to take home with you. All stand holders are passionate about the products they offer, giving this market a unique vibe. Next to food you can expect a mix of vintage fashion, gift items and live entertainment. Amstelpark – 15 december / Park Frankendael – 23 December – 11:00 a.m. to 5:00 p.m.
On 15 and 16 December the small hippie village Ruigoord, located just outside of Amsterdam, will turn into a Winter Wondermarket. Over 50 stands will offer anything from handmade fashion and art to gluhwein and delicious food. The market takes place both in- and outdoors with lots of activities and workshops like making your own jewelry, scavenger hunts, massages and tarot card readers. Browse the market stands for unique gifts, enjoy all the live entertainment and indulge in delightful Christmas food & beverages. Everything you need for a magical afternoon. 15 & 16 December – Ruigoord – 12:00 to 6:00 p.m. The Funky Xmas Market edition of the monthly Sunday Market at the Westergasfabriek promises to be a good one. The returning Sunday Market is all about art, fashion and design by local artists. Next to that you’ll be able to enjoy food from different international cuisines, workshops, live entertainment and more. A perfect place for a family day out! 16 December -Westergasfabriek – 12:00 to 6:00 p.m. 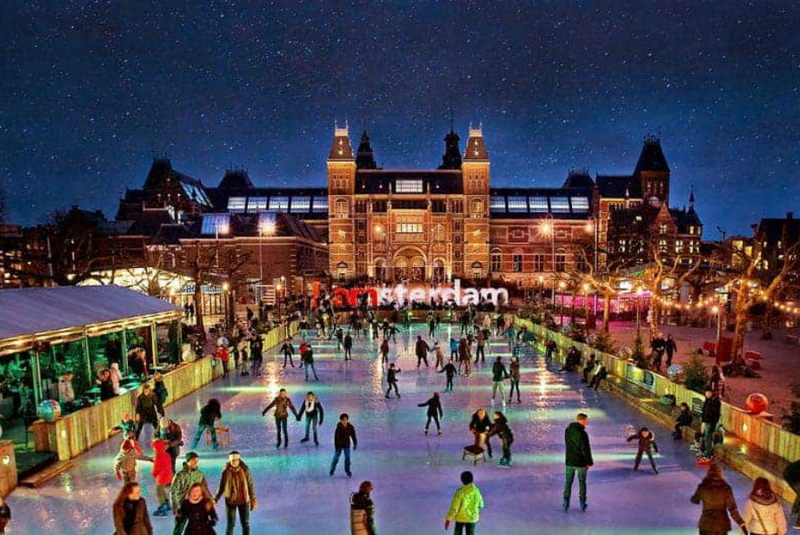 The Amsterdam Rai will be home to the biggest winter spectacle in town. 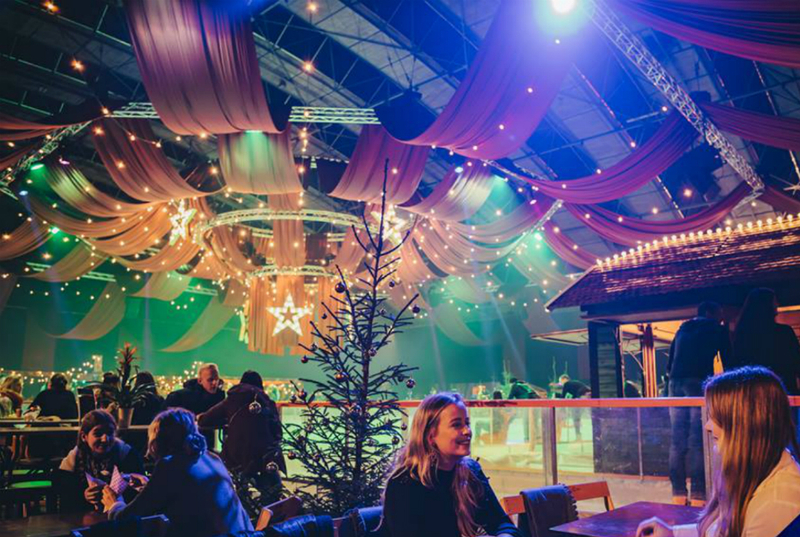 From 21 to 30 December you can head over to the Amsterdam Winter Paradise (Amsterdamse Winterparadijs) for the ultimate Christmas experience. There will be an in- and outdoor ice-skating rink, a giant Ferris wheel and they even have real snow! At night the program is filled with music performances and classic Christmas movies shown at the cinema. Warm your hands by the bomb fire with a hot chocolate and roast your own marshmallows. Hungry? Some of the best restaurants in town will set up food trucks offering special winter inspires dishes and beverages. What more do you want?! 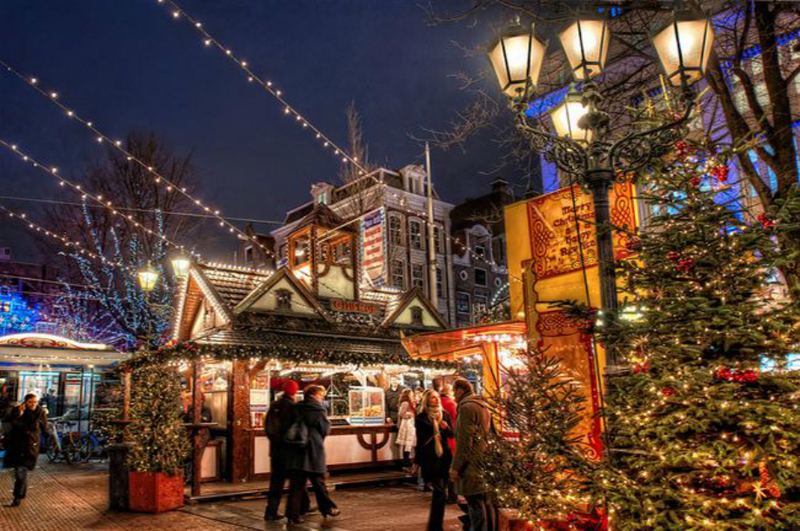 We hope you have the best time using our Amsterdam Christmas Markets Guide. For more on things to do and places to eat in December, check out our Amsterdam in December article. Happy Holidays!